Ah, The Warmth of … the color Cobalt? The problem was, that the swatch of Cobalt color on the spa picker, and the little icon for it, and the actual color it changed your desired spa to, and the other thumbnail image of it on the Features pages, did not all match up. Oh yea, this is for the good of our friends over at Jacuzzi Hot Tubs. Russell and Travis had tried to make it work, but it took me, the color-blind web developer, to get it done. Let it never be said that Ninthlink is not an equal-opportunity employer. 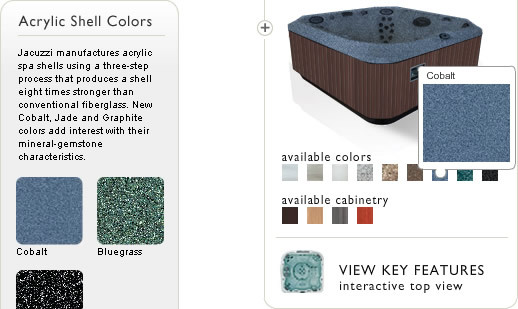 The reason it was off, see, is because in order to make the colors appear over any of the many different spas that Jacuzzi Hot Tubs has to offer, there is a color swatch, which we have aptly called the “tint”. For example, here is the J-325 spa in both Platinum and Cobalt, with the two tint images underneath.